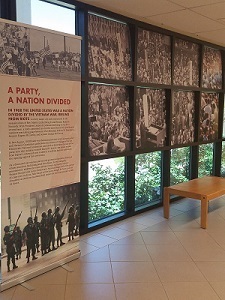 This exhibit focuses on the 1968 Democratic National Convention where Senator Daniel K. Inouye delivered his groundbreaking keynote speech that brought him into the national spotlight. The Senator’s speech addressed the rising tensions in the United States from its involvement in the Vietnam War and the aftermath of the assassination of the Reverend Martin Luther King Jr. The exhibit features documents, photographs, and artifacts from the University of Hawaii at Manoa’s Hawaii Congressional Papers Collection, ʻUluʻulu: The Henry Kuʻualoha Giugni Moving Image Archive of Hawaiʻi, and the personal collections of Heather Giugni and Bernie Kleina.